143 Beacon is located on the south side of Beacon, between Arlington and Berkeley, with 141 Beacon to the east and 145 Beacon to the west. 143 Beacon was built ca. 1861, one of two contiguous houses (143-145 Beacon) built at the same time as a symmetrical pair, with 145 Beacon four feet wider than 143 Beacon. 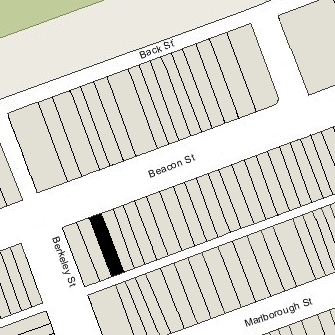 The party wall between the two houses has a one foot jog to the east so that the frontage of 143 Beacon is 20 feet on Beacon and 19 feet on Alley 421. 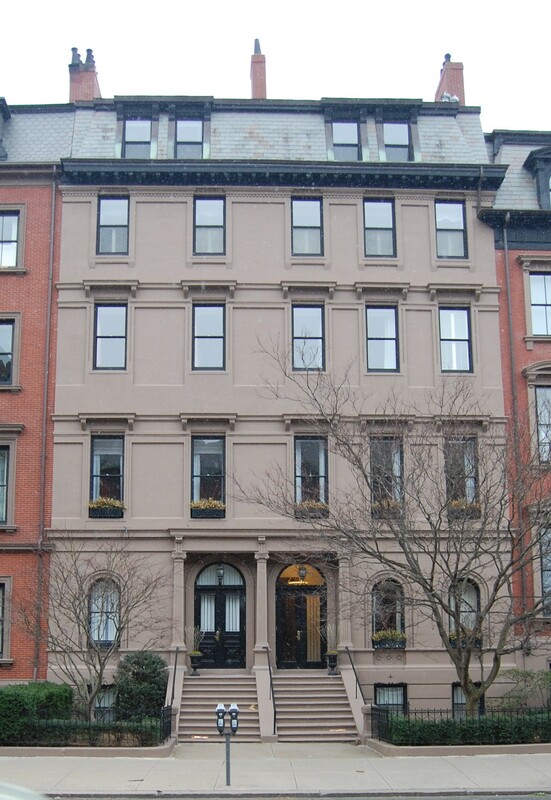 Both houses were built for shipping merchant and real estate investor John Lowell Gardner, along with the adjoining house at 147 Beacon (the entrance to which was moved to Berkeley Street ca. 1906 and the house renumbered 303 Berkeley). John L. Gardner and his wife, Catharine Elizabeth (Peabody) Gardner, lived at 7 Beacon, and would build a new home at 182 Beacon in the mid-1860s. The land on which 143-145 Beacon were built was part of a larger parcel John L. Gardner had purchased on September 15, 1859, from William W. Goddard and T. Bigelow Lawrence. 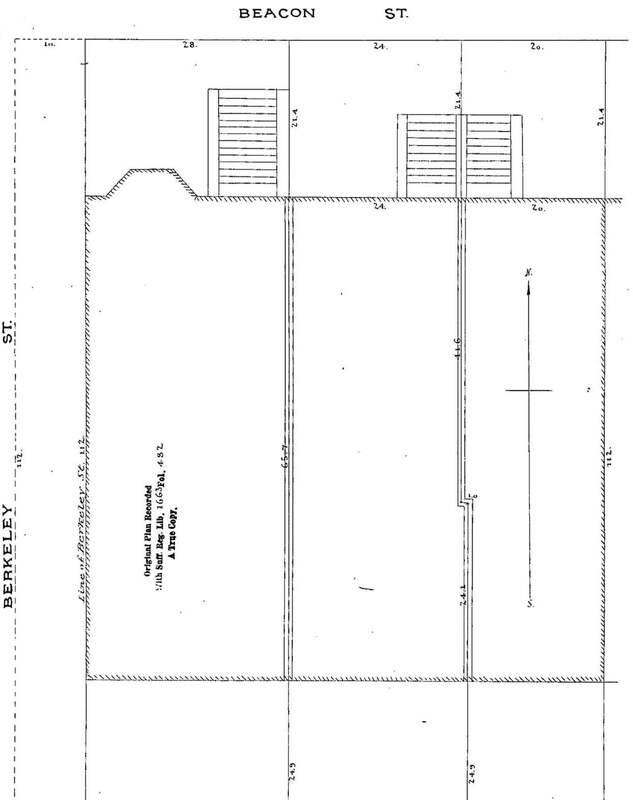 That parcel included the land on the south side of Beacon running from Berkeley east 114 feet; John L. Gardner sold the land to the east, where 139-141 Beacon would be built, and retained the land to the west for 143-145-147 Beacon. The parcel originally was part of a tract of land that William Goddard and T. Bigelow Lawrence had purchased from the Commonwealth of Massachusetts on August 1, 1857, that included all of the land on the south side Beacon Street from Arlington to Berkeley. Click here for an index to the deeds for 143 Beacon. By 1863, 143 Beacon was the home of Matthias Ellis and his wife, Sarah Seymour (Forsyth) Ellis. They previously had lived in Europe, where their daughter, Marie Louise (Zaidee) Ellis, was born in December of 1862. He was an iron manufacturer and maker of stoves, parlor grates, registers, and similar items. They continued to live at 143 Beacon until about 1866, when they moved to New York City. By 1867, 143 Beacon had become the home of John Lowell Gardner’s brother-in-law and sister, Horace Gray and Sarah Russell (Gardner) Gray. They previously had lived on Summer Street at the corner of Kingston. Horace Gray was a shipping merchant and iron dealer. An ardent horticulturalist, in the late 1830s and 1840s he had been a principal mover for creation of the Boston Public Garden. Living with the Grays at 143 Beacon were their sons, John Chipman Gray and Russell Gray, both lawyers. Also living with them were Elizabeth Chipman Gray and Harriet Gray, Horace Gray’s daughters with his first wife, Harriet (Upham) Gray. His son by his first marriage, Horace Gray, Jr., lived at 4 Mt, Vernon Place. He was Chief Justice of the Massachusetts Supreme Judicial Court and, in 1884, was appointed a Justice of the US Supreme Court. John Chipman Gray married in June of 1873 to Anna Sophia Lyman Mason. After their marriage, they lived at 83 Marlborough. John L. Gardner died in July of 1884. In his will, he left 143-145 Beacon in trust for the benefit of the children of his deceased son, Joseph Peabody Gardner: Joseph Peabody Gardner, Jr., William Amory Gardner, and Augustus Peabody Gardner. Joseph Peabody Gardner, Jr., died in October of 1886, and on December 31, 1886, the trustees transferred 143-145 Beacon to William Amory Gardner and Augustus Peabody Gardner, they both having reached the age of 21. Sarah Gray continued to live at 143 Beacon with Elizabeth, Harriet, and Russell Gray. Russell Gray married in November of 1886 to Amy Heard. After their marriage, they lived at 39 Marlborough. By the late 1880s, Harriet Gray had moved to Wellesley Hills. 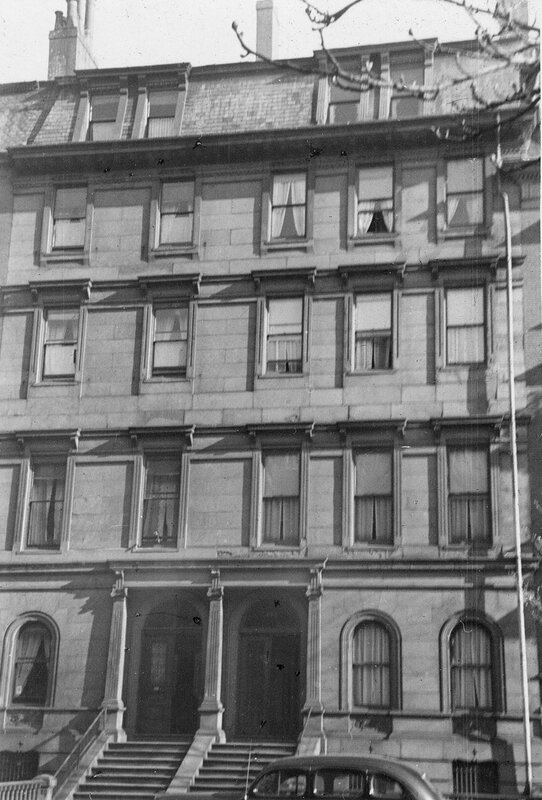 She continued to live there in 1900, by which time she also maintained a Boston home at the Hotel Hamilton at 260 Clarendon. She continued to live there until the 1908-1909 winter season, when she moved to 178 Beacon. Sarah Gray died in September of 1893. After her death, 143 Beacon became the home of her unmarried step-daughter, Elizabeth Chipman Gray. She continued to live there until her death in August of 1897. 143 Beacon was not listed in the 1898 and 1899 Blue Books. By the 1899-1900 winter season, 143 Beacon was the home of Mrs. Sarah Williams (Lothrop) King, the widow of iron and steel manufacturer George Parsons King. She previously had lived at The Empire at 333 Commonwealth. She first leased the house from William A. Gardner and Augustus P. Gardner, and then on April 5, 1907, it was acquired by Henry Parsons King and William Stuart Spaulding, trustees under the will of George P. King. Henry P. King was George and Sarah King’s son and William S. Spaulding was Henry P. King’s brother-in-law,. Henry and Alice Ormond (Spaulding) King lived at 118 Beacon. Sarah King’s unmarried daughter, Anne Lothrop King, lived with her until her death in February of 1910. Sarah King continued to live at 143 Beacon until her death in January of 1913. During the 1913-1914 winter season, 143 Beacon was the home of George Eddy Warren, a coal and oil distributor and shipper, and his wife, Frances Wightman (Knowles) Warren. They had lived at 118 Marlborough during the previous season, and by the 1914-1915 season had moved to a new home they had built at 148 Beacon. On May 29, 1914, 143 Beacon was acquired from the estates of George P. King and Henry P. King (who had died in October of 1913) by Francis Gardner Curtis. He and his wife, Mary Winchester (Barnard) Curtis, made it their home. They had married in April of 1913, and had lived at 27 Brimmer during the 1913-1914 winter season. Prior to their marriage he had lived at 253 Marlborough with his mother, Helen Read (Gardner) Curtis, the widow of James Freeman Curtis. Francis Curtis was the great-nephew of John Lowell Gardner (his mother was the daughter of John L. Gardner’s brother, George). He was assistant curator in Chinese and Japanese art for the Museum of Fine Arts. He died in November of 1915. Mary Curtis continued to live at 143 Beacon and also maintained a home at Mattapoisett. Mary Curtis continued to live at 143 Beacon until her death in 1956. On July 27, 1956, 143 Beacon was acquired from the estate of Francis G. Curtis by Sanford Lee Fisher, president of Fisher Junior College (founded by his father, Myron C. Fisher, Sr., and his uncle, Edmund H. Fisher). On September 25, 1956, it was acquired from him by Fisher Junior College. October 1, 1956, 143 Beacon was acquired from Fisher College by Emerson College. Emerson College already owned 145 Beacon and 303 Berkeley, and also owned 126-128-130 Beacon, across the street.